A woman injured in a road accident in County Fermanagh on Sunday has died in hospital. Two men were also hurt in the crash on the Glengesh Road in Tempo. One vehicle was involved. On Sunday, four men died after their car was in a head-on collision with a lorry on the Tandragee Road in Newry. The men, all from the city of Aveiro in northern Portugal, were killed instantly. The lorry driver was shocked but uninjured. A fifth man, also from Aveiro, who was in the car with them, is in a serious but stable condition in the Royal Victoria Hospital, Belfast. It is understood the men were all living and working in Dublin. They were employed by a Portuguese company which is carrying out work at Dublin Airport's new terminal building. The injured man has a wife and two children living in Portadown. They were travelling to visit them when the accident happened. A community worker said the entire Portuguese community in Northern Ireland - which numbers about 500 to 600 people - was "numb with shock". Ulster Unionist assembly member Danny Kennedy said he was very sorry for all those involved. "Our shock and profound sympathy go to all of those killed and injured in the accident," he said. "These are very highly traumatic incidents. All families involved, including that of the lorry driver, will have their lives changed utterly. "It is an extremely bad corner on a stretch of road which has claimed a number of lives over the years." SDLP assembly member Dominic Bradley said people had been shocked at the deaths. "People in the area are shocked about this horrific and tragic accident," he said. "Once again, it's a reminder of the dangers that are always present on our roads." Meanwhile, a 47-year-old motorcyclist injured in a collision with a van in County Tyrone on Saturday has died. He was Robert Hutchinson, 48, a mechanic from Tullyhogue, outside Cookstown. 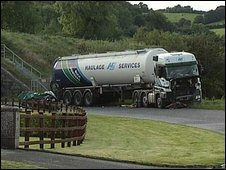 The accident happened on Barony Road near Creggan Crossroads, the main Omagh to Cookstown road, at about 1320 BST. Police have also appealed for any witnesses to this accident to contact them. Seventy-nine people have died on Northern Ireland's roads so far this year. The figure for the same period last year was 73.